Last month, Food and Drug Administration menu labeling regulations went into effect, eliciting concerns from hundreds of thousands of restaurants now required to display calorie counts on menus. The FDA argues that the calorie count rule helps promote healthy lifestyles, but many restaurant chains are apprehensive of its effects on business. In a survey of U.S. adults, roughly one-third of respondents (34%) said they generally pay attention to calorie counts at any type of restaurant. While this indicates that most consumers tend to ignore this information, 60% reported that calorie counts slightly or heavily influence their ordering decision. Survey findings suggest that restaurants and brand marketers can expect a substantial impact on consumer behavior. According to survey results, consumers are most likely to ignore calorie counts at a fast food drive thru, with 70% reporting as such. When asked in which scenario calorie count was most likely to influence ordering decisions, most respondents said when dining in at a fast food restaurant (38%), followed by casual dining restaurant (25%). Fine dining establishments can expect patrons to be the least affected, with only 10% indicating that calorie counts are most likely to influence ordering behavior at this type of restaurant. 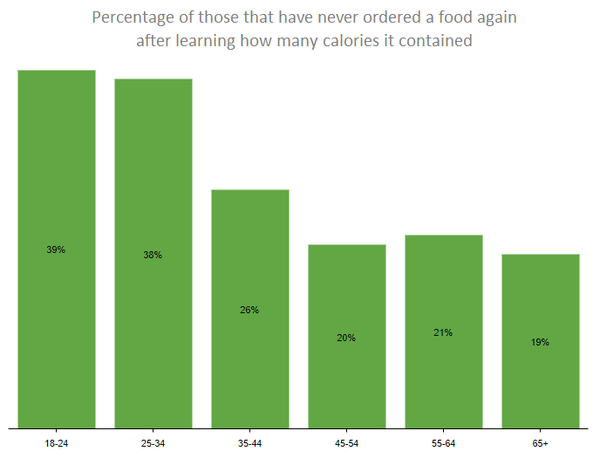 Overall, the West had the highest percentage of respondents to report that calorie counts would slightly or heavily influence ordering decisions, at 66%. Young Millennial males appear to be the most influenced demographic, with 70% between the ages of 18 and 24 reporting that calorie counts slightly or heavily influence the food they order. This number remained consistent for females of the same age cohort, at 65%. Survey results indicate that consumer behavior patterns of older demographics will be less affected, especially for older males. Fifty-five percent of men between the ages of 55 and 64 reported that calorie counts would have no influence on ordering decisions.Seventy-two percent of the 55-64 cohort said they generally ignore calorie counts, making them the least interested demographic. Overall, men were more likely to ignore this information than women. Survey findings also reveal that the caloric value of a food item can leave a lasting impression. Twenty-seven percent of respondents could recall a food item they did not order again after becoming aware of its calorie count. Young adults of the 18-24 and 25-34 cohorts most frequently recalled such an experience, at 39% and 38%, respectively. Results also suggest that fast food establishments with unfavorable calorie counts can expect these types of reactions most frequently, with 64% of respondents indicating that their “forbidden food” is from a fast food restaurant. While 61% of respondents expressed that they rarely or never seek out calorie information independently, many said they like to see it on a menu. Nearly half (46%) said they like seeing this information on a menu when dining in at a fast food restaurant. Casual dining restaurants saw similar results, at 44%. Across all restaurant types, 86% of respondents said they either like exposure to calorie counts or are indifferent. Go here for a visual look at the stats.